My February map updates included an increase in the routes covered, with the addition of a map covering the Hollinwood Canal and the Stockport Canal. Some might consider these to be called the Hollinwood Branch Canal and the Stockport Branch Canal and both to be branches of the Ashton Canal, but I’m using the shorter name they are gradually becoming known by. The map includes the Fairbottom Branch of the Hollinwood Canal, and the Werneth Branch Canal, a stand alone canal, despite the “Branch” in the title which is often mistaken for a branch of the Hollinwood Canal. Restoration of most of the Hollinwood Canal looks possible, excluding the most northern section after the motorway, but a link to the Rochdale Canal looks possible instead. 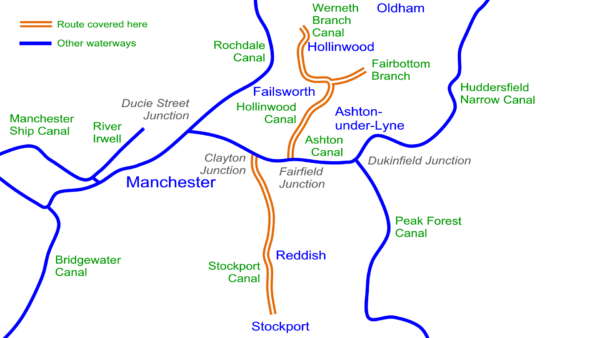 Restoration of the Stockport Canal might be possible for the northern half of the route but the southern part (within Stockport) looks unlikely as the route is blocked by too many developments and, regrettably, some of these seem very recent. The Hollinwood and Stockport Canal Maps are free to download, as are all the maps for canal restoration projects, and available in both Acrobat (pdf) and Memory-Map (qct) formats. They are included in the England & Wales Canal Maps from the February 2016 issue onwards. This entry was posted in Fairbottom Branch, Hollinwood Canal, Werneth Branch Canal by Paul. Bookmark the permalink.